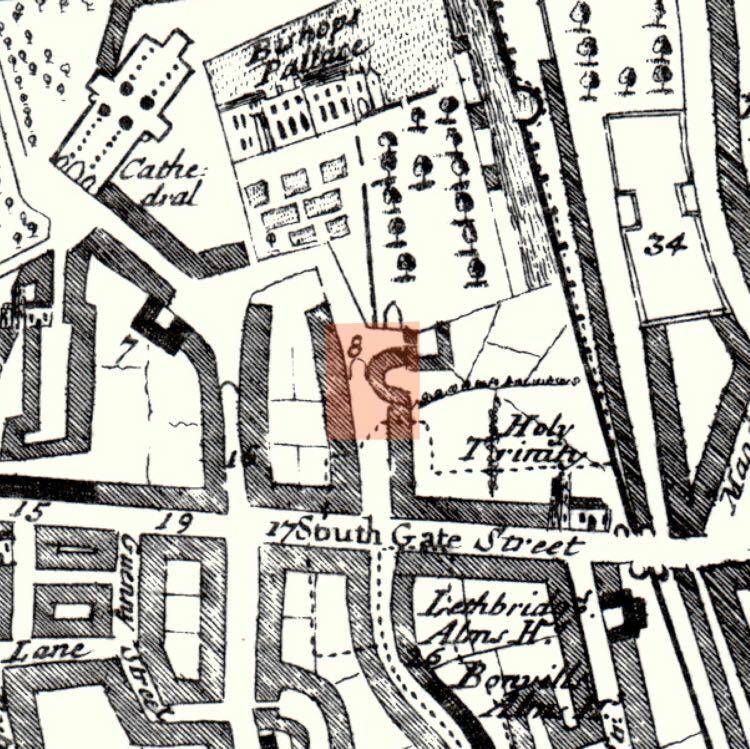 The long lost Palace Gate was one of the seven gates around Cathedral Close. The gate was situated in front of the Bishop’s Gate entrance to the Bishop’s Palace and garden. The Close was gated in 1286, after the murder of Walter Lechlade, on the 5 November 1283; this was so the Close could be closed at night to prevent strangers entering, and causing an incident. The Bishop and Dean and Chapter erected seven gates around Cathedral Yard, including a gate in Palace Gate (street). The smaller gates around the Close were modest affairs, with a simple slate roof and heavy, double timber gates. Gradually, chambers were added over the gates, probably to generate income for the Cathedral. 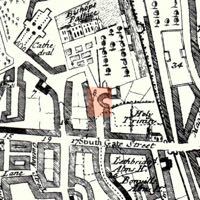 In 1662, Dr Hall and Mr Stephens inspected Palace and St Katherine’s Gates with a view to building chambers over them, so long as "this may be done without nuisance to the houses adjacent”. 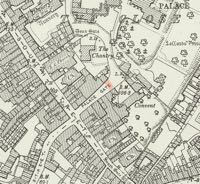 Soon after Mr Richard Prosser was given a lease to build a chamber over Palace Gate at his own expense. The Close was a dimly lit place at night, and in 1750 eight oil lamps were purchased for installation at various points, including Palace Gate, and a suitable person was to be employed to light them in the winter. Stairs were installed at the gate in 1766. In 1768, Mr Tothill was asked to tender to repair a badly decayed gate, but his offer was not accepted. Next, Giles Painter was asked to suggest remedial action. He suggested repairs to both gates, removing the existing roof and top braces, securing the lintel with a new saddle, replacing decayed portions with new panels, reusing oak plates for stays and braces and moving the bottom braces further back "that the gates may open wider to give more roome for carriages to pass which is the present cause of the gates being damaged”. 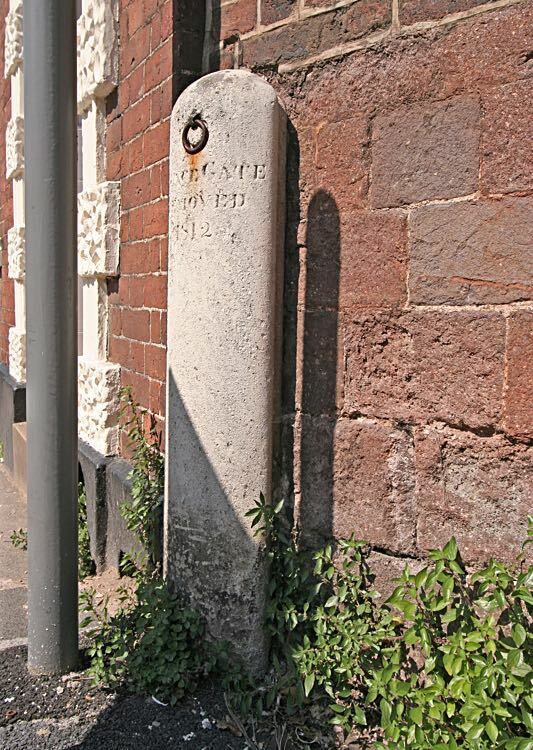 Still the authorities were not satisfied and Edward Wills was invited to submit his proposal to rebuild the piers in Heavitree stone at £15 15s or in brick for £7. In the event, the gate was repaired as nothing more was recorded. By the 19th Century, the gates around the Close were proving to be a hindrance to traffic. 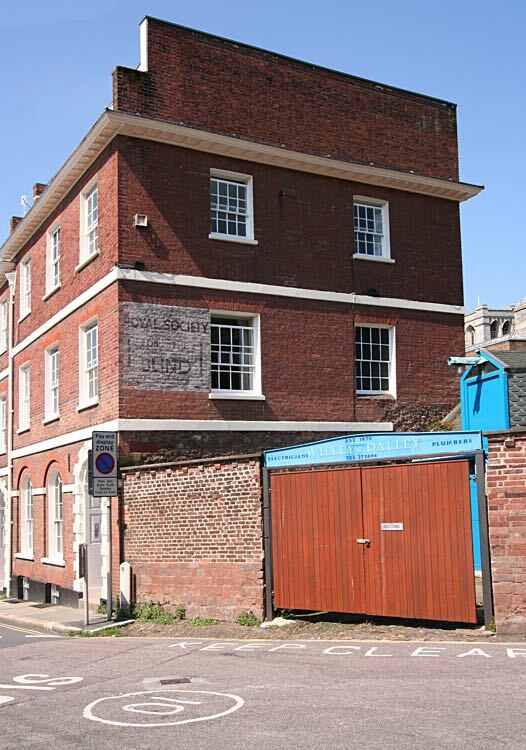 The Chapter clerk proposed in 1810 that the house next to the gate be purchased and demolished for the road to be widened and a new gate erected “to be shut as usual during night”, but left open at all times as “a footway so long as the free passage there of foot passengers by night as well as day shall not be found inconvenient”. 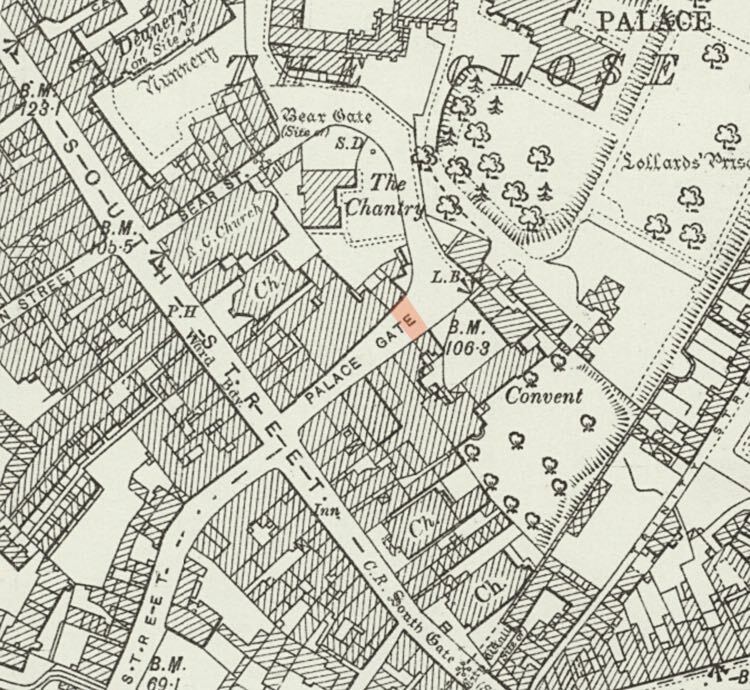 A plan for the St Sidwell's feoffees shows the Peter Bell tavern next to the Palace Gate, this being the house to be demolished–the roadway was half the width of Palace Street while the tavern blocked the right half. The gate was taken down, and as there was no longer a barrier across the road, temporary posts and chain were erected to prevent the passage of horses and carriages “for the usual hours at night as often as the Chapter shall think fit...and at least on Midsummer Day in every year”. No permanent gate was erected, and the position of the old gate was marked with posts on opposite side of the street. Only one post remains, with an iron ring for a chain to be attached and stretched across the street, on Midsummers Day to prevent the rights of the Cathedral to close the thoroughfare. Sources: The Cathedral Archives, Devon Life, British Newspaper Archive. The post for the Palace Gate is by the corner of the building. The post where the Palace Gate was sited. The U-shaped building was the Peter Bell Tavern.